Hans Walther is a Dutch film maker and animation enthusiast. In the animation world he is known as the talk show host of the KLIK Amsterdam Animation Festival. But Hans Walther is also one of the most important animation artwork collectors in the Netherlands. We talked with Hans Walther to learn more about the market value of animation artwork and the practice of handling, mounting and restoration in the commercial circuit. The first cel Hans Walther bought: a limited edition set up with an original cel from Snow White and the Seven Dwarfs (1937). Multi-Cel progression setup with background from title sequence of Dutch television programme The Challenge / De Uitdaging (1990), directed by Ronald Bijlsma. We discussed Hans Walther’s’ experience with collecting artwork through galleries and auction houses, both internationally and in The Netherlands. The market was at its height in the 1990s. 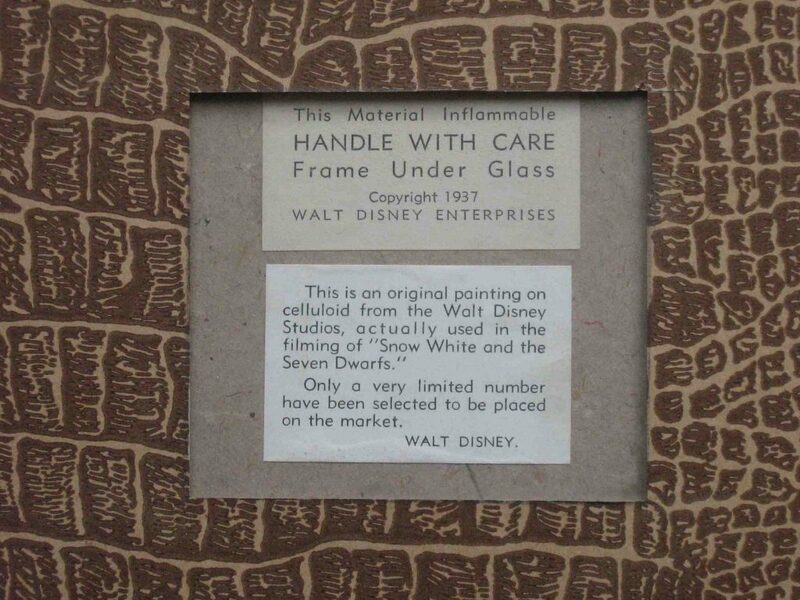 “Prices just went everywhere: an original Disney cel with an original background would easily yield 150.000 to 200.000 guilders” (now roughly 45.000 – 70.000 euro).“ And not only artwork from Disney, also artwork from other important studios like Metro-Goldwyn-Mayer or the Fleischer Studios was sold for considerable prices. Now art dealers still ask relatively high prices for original cels and other artwork from the American studio’s, but the heydays of collecting analogue animation artwork are over. Cels from Snow White and the Seven Dwarfs with a hand painted Courvoisier background. Hans Walther also gave us an insight in some of the restoration methods used when restoring animation artwork for the market. Some restorers, for example, restored a damaged paint layer with missing paint on a cel by dissolving the paint surrounding the tiny gap and then manipulating the softened paint into the lacuna. There weren’t any restorers specialized in cels at that time. Restorations were executed by artists or by the animation studio that still had some of the original colours. Hans Walther introduced us to the mounting of cels for commercial purposes. It is a common – and among collectors generally accepted – practice to combine cels from different scenes with a background to make a more appealing picture. 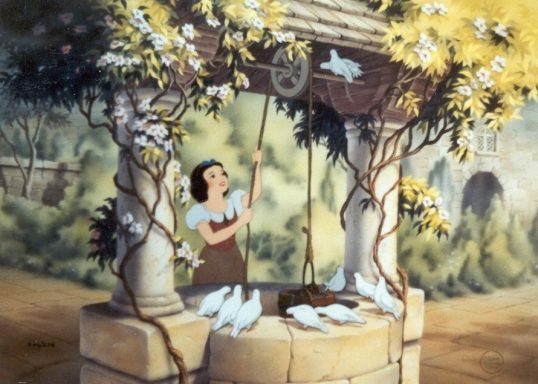 The turtle and the rabbit in the image to the right are a good example: in the film Snow White and the Seven Dwarfs the two are never shown together as you see in this setup made of two cels and a background. Another practice, which Hans Walther also uses himself, is the creation of new decorative backgrounds to go with original cels These backgrounds vary from wood veneer to hand drawn copies or photocopied backgrounds. Original Courvoisier label on the back of a framed Disney cel setup. In the trade in original Disney cels, the creation of new backgrounds that were never used in the original film, was a common practice for which especially the Courvoisier Gallery was famous. The Courvoisier Gallery was the first gallery to specialize in animation artwork. Guthrie Courvoisier started selling Disney Art in 1937 shortly after the release of Snow White. He collaborated with animation artists that had worked on the film at the Disney studio to create new backgrounds and to assemble and prepare the artwork. 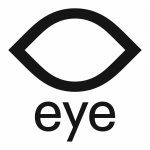 A selection of the collection of Hans Walther can be found on his website where almost everything is for sale, you just have to offer the right price! Previous PostHelp, why did this paint get sticky? Next PostLife just got more difficult!